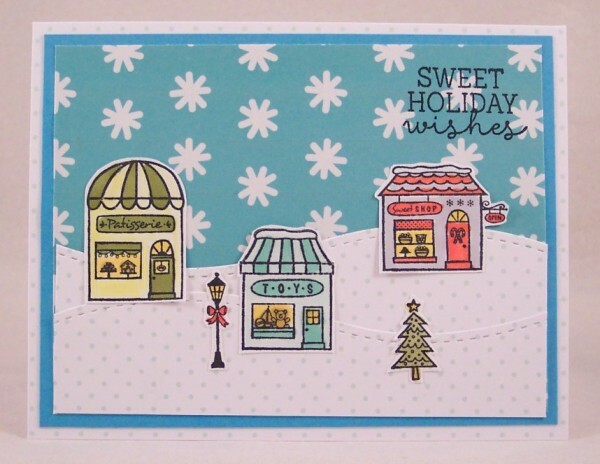 For my first card I made an adorable winter scene using the stamps from the Christmas in Our Town set, coloring them with alcohol markers and adding a bit of sparkle with the Wink Of Stella pen. I added them onto hills die cut from the Landscape die cut set from Reverse Polka dot cardstock. The snowflake background is from the Dear Santa digital papers set. With this digital paper pack you can print as many sheets of papers as you need! Next I altered the witch girl from the Spooky Girlfriend set, trimming her hat brim and cutting off the broom. 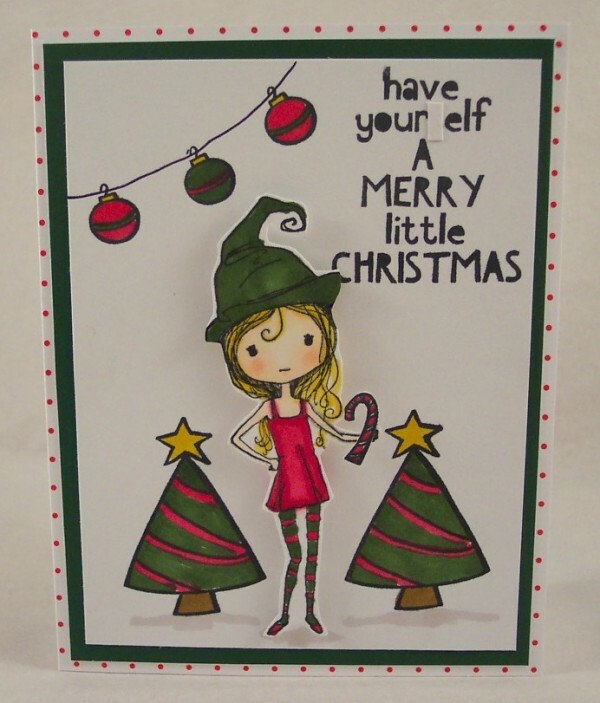 Instead I added a candy cane in her hand and colored her with traditional holiday colors and turned her into an elf! All the other stamps on the card are from the Santa and Friends set. I also blocked out the “s” in “self” so it now reads “elf”. I think she turned out really cute, I love altering stamps to fit another purpose! 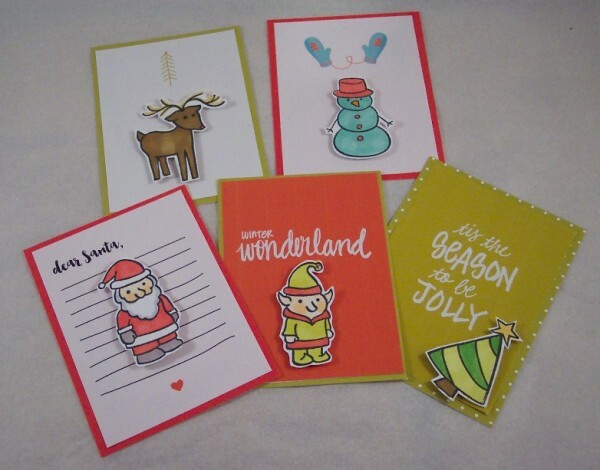 Lastly I printed out the journal cards from the digital Dear Santa printable papers, mounting them on cardstock and adding stamps from the Santa and Friends set. 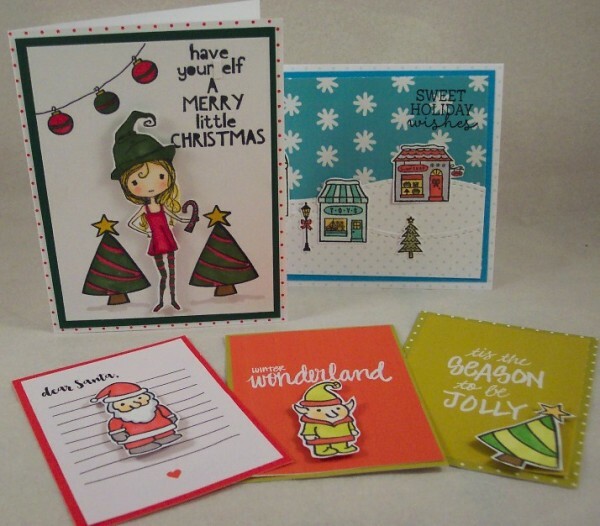 These would be great for scrapbooking, Artist Trading Card swaps, gift tags or name place cards on a holiday table. These are all so cute but the scene with the buildings and snowflakes is my favorite. Thanks for sharing all of these great ideas with us! Thanks for sharing your creativity. Love all your projects. I don’t know how I missed these earlier! Love your little elf transformation and the snowy village scene.